Label free quantification is mostly applicable for proteome analysis of clinical samples. This approach is generally applied for biomarker discovery by direct comparison of the level of proteins present in the healthy and the diseased tissue. Samples are completely solubilised in a lysis buffers and proteins extracted are digested with trypsin. The resulting peptides are loaded and separated on an Ultima 3000 nano-LC (with up to 2hrs separation gradient) coupled to Velos Pro-Orbitrap or Q-Exactive Plus mass spectrometer (Thermo Fisher Scientific). Label free LC-MS/MS-based comparative proteomics using peptide peak intensity comparison between samples allows accurate quantification of proteins in tissues samples. This method generally gives a truer picture of the proteins present in comparison to error-prone in-vitro labelling reactions that are used for other proteomics quantitation-based methods. Progenesis LC-MS software (Nonlinear) is used to compare sample spectra. Profile data of MS scans from each sample are transformed to peak lists with respective peak m/z values, intensities, abundances and m/z width. Generally, a sample is selected as a reference and the retention times of all the other samples are aligned to a maximal overlay of the 2D features and raw abundances. Protein identification is performed using Mascot and assigned peptides are re-imported as an mgf file into the Progenesis software for identification and quantification of proteins. Quantitation of each protein is generated by summing all peptide ion isotope abundances unique to a specific protein in each run. Relative protein expression (fold change) and the reliability of the measured differences (ANOVA, P value) are calculated between each group using the summed peptide ion abundance. 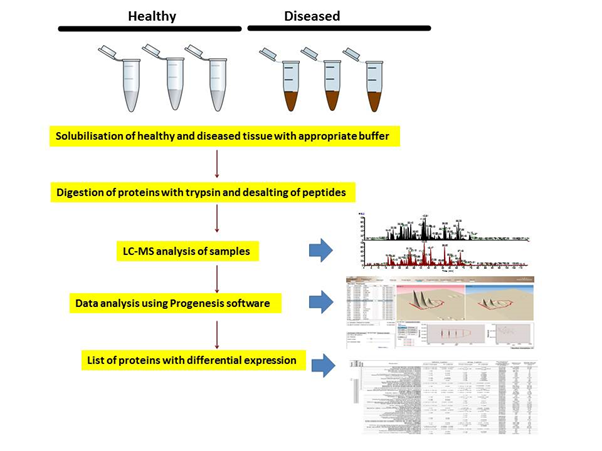 This method allows identification and quantification of hundreds of proteins in a single run and export of the proteins into excel platform allowing a number of filters to be applied.